Major League Baseball’s July 31 non-waiver trade deadline prompted a flurry of deals involving former Cape League players. By our count, at least 13 CCBL grads are now receiving their pay checks from new teams and that number does not include players moved in recent waiver deals, such as the three-man swap Aug. 7 when the Atlanta Braves sent third baseman Chris Johnson (Hyannis, 2005) to the Cleveland Indians for outfielder-DH Nick Swisher (Wareham, 2000) and center fielder Michael Bourn (Y-D, 2002). In two other post-deadline moves, the surging Toronto Blue Jays claimed right-handed pitcher Ben Rowen (Cotuit, 2009) off waivers from the Chicago Cubs and sent shortstop Dawel Lugo to the Arizona Diamondbacks for shortstop Cliff Pennington (Falmouth, 2004). The Blue Jays and the Los Angeles Angels of Anaheim were two of the most active traders in the days leading up to the non-waiver deadline. Left-handed pitcher Matt Boyd (Orleans, 2011-12) was one of three lefties dispatched to Detroit by Toronto for Tigers ace David Price. The Blue Jays also acquired right-hander Mark Lowe from Seattle in exchange for a trio of southpaws, including Rob Rasmussen (Orleans, 2008-09). And righty Jeff Hoffman (Hyannis, 2012-13) was among four players the Blue Jays sent to the Colorado Rockies in the deal which brought righty LaTroy Hawkins and shortstop Troy Tulowitzki to Toronto. 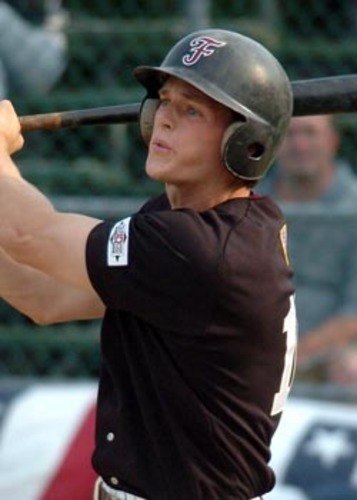 Third baseman Conor Gillaspie (Falmouth, 2007), the former Cape League MVP and batting champ, was acquired by the Angels from the Chicago White Sox in a cash deal. L.A. also stocked up on outfielders, picking up Shane Victorino from Boston in exchange for infielder Josh Rutledge (Y-D, 2008-09), veteran David DeJesus (Chatham, 1999) from Tampa Bay for right-handed pitcher Eduar Lopez and left fielder David Murpy (Wareham, 2001-02) from Cleveland for shortstop Eric Stametz (Hyannis, 2011). Kansas City sent veteran right-hander Joe Blanton (Bourne, 2001) to Pittsburgh in a cash deal and dispatched three left-handed pitchers, including Brandon Finnegan (Falmouth, 2013), to Cincinnati for right-hander Johnny Cueto. Finnegan, the only player to appear in both the College World Series and MLB World Series in the same year, made his MLB debut last Sept. 6. He was the Royals’ first-round draft pick (17th overall) last June while still pitching for TCU in Omaha. He is currently starting at Triple-A Louisville. Shortstop JaCoby Jones (Harwich, 2011-12), was picked up by the Detroit Tigers from the Pirates for right-handed pitcher Joakim Soria. 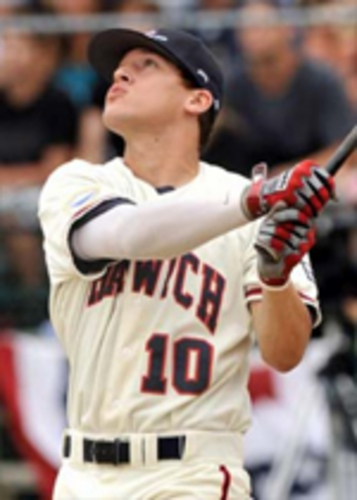 Jones, who won the 2012 Home Run Hitting Contest at the Cape League All-Star game in Harwich, was assigned to Double-A Erie, where, in his third game for the Sea Wolves, he slugged three home runs against the New Britain Rock Cats. Right-handed pitcher Ryan Cook (Brewster, 2007) was acquired by Boston from Oakland for a player to be named later and infielder-outfielder Dustin Ackley (Harwich, 2008) went from Seattle to the New York Yankees for outfielder Ramon Flores and right-handed pitcher Jose Ramirez.